I like your mixture of camouflage patterns. Looks like you are wearing the German Flecktarn (Spot pattern) boonie, Advantage Timber balaclava and a British DPM (Disruptive Pattern Material) 1995 (Soldier 95) issue rip-stop smock. 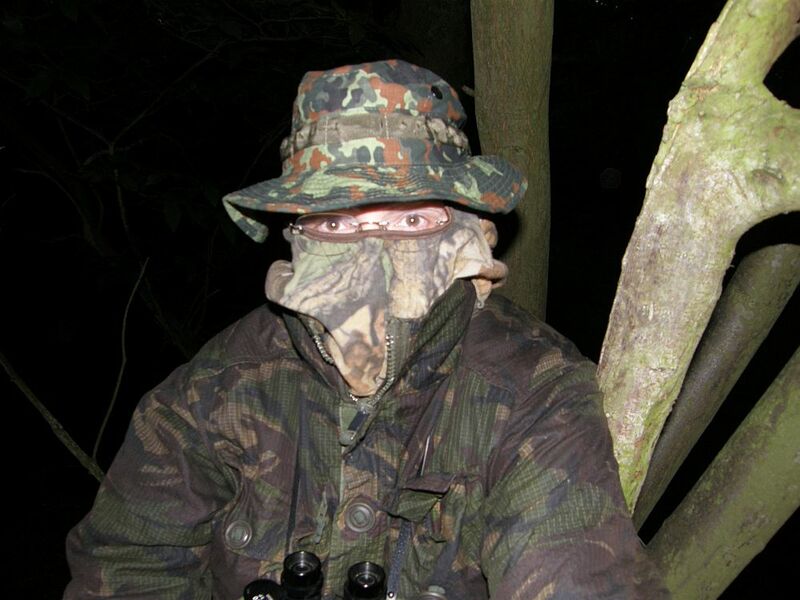 In case you are wondering, the most effective military camouflage pattern in temperate woodlands is US Woodland 1981 to 2008 issue on the nylon cotton NYCO fabric. A few years ago I carried out an extensive test and that was the winner. The Natick Soldier Center in USA carried out similar tests in woodland but also in desert and urban terrains also, they found the Chinese Woodland camouflage pattern to be the most effective in the woodlands, which is quite similar to US Woodland. The most effective over all terrains was a pattern called German Tan & Water/Sumpftarn (Marsh pattern). Mil-Tec manufacture Tan & Water but they call it BGS.